Single Parents: Join us every first Saturday, 3pm-5pm, as we empower you with an informative workshop and supportive fellowship! Admission is FREE and children are welcome. 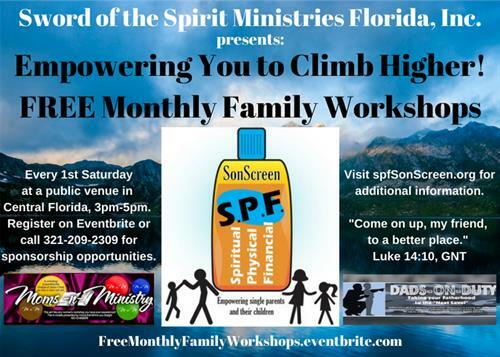 Be encouraged and educated by community representatives, ministry leaders and other presenters who will help to provide what your entire family needs to be successful spiritually, physically and financially! If you would like to sponsor one of our monthly events, please email your logo, company information and headshot to spfSonScreen@gmail.com for promotion. We are a 501c3 organization and also accept tax deductible donations. Register at http://FreeMonthlyFamilyWorkshops.eventbrite.com.